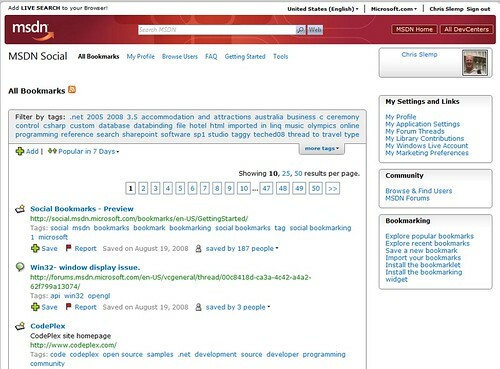 MSDN and TechNet go "Social"
Microsoft is opening up the MSDN, TechNet, and Expression sites to the community, so that technical professionals can better connect with each other, share knowledge, and succeed. Tagging – and especially social bookmarking – are essential ingredients for making this happen. Availability in 12 Languages: With the September release, the social bookmarking application will be available in Chinese (Simplified and Traditional), Czech, English, French, German, Italian, Japanese, Korean, Portuguese, Russian, and Spanish.